Ranbir Kapoor, Katrina Kaif, Saswata Chatterjee et al. The protagonist Jagga (Ranbir Kapoor) is a shy young boy in a quaint little town, who lives with his accident-prone father, Bagchi (Saswata Chatterjee). As he grows up, his father admits him to a boarding school - and mysteriously goes missing. Over the years, the only contact Jagga has with his father is a VHS tape that he sends via post every year on his birthday. 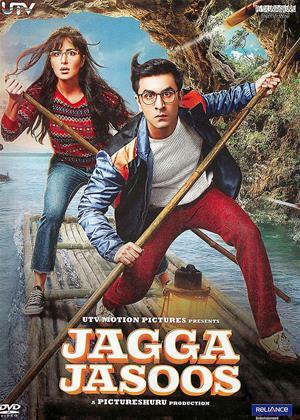 Jagga grows into a curious, clever and sharp person - a quasi-detective, using tricks he had learnt from his father, his curiosity leads him to Shruti (Katrina Kaif), a journalist who lands up in Jagga's town trying to expose a high level international case. As Jagga gets involved and tries to help Shruti in unraveling this case, he is surprised to discover that Shruti is very similar to his father, as she too is accident-prone! When Jagga's father misses sending a birthday tape, he seeks to find him and uncover the mystery surrounding his father. A disbelieving Jagga asks for Shruti's help to solve his life's most important case - the search for his dad. Curious yet clueless, Jagga and Shruti embark on a mission to uncover details about Bagchi's life and find themselves embroiled in adventures which take them across the world!